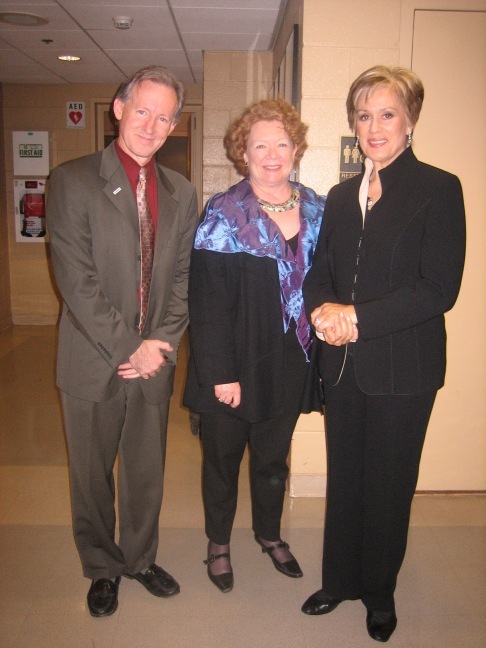 WASHINGTON – The reason I’m posting from downtown D.C. this morning has to do with the lady on the left — jazz vocalist Patti Austin, who helped to usher in the New Year with a dynamic all-Gershwin concert at the Kennedy Center last night. Patti’s two-set show, backed by a crackerjack octet (piano, guitar, bass, drums, sax, trumpet, ‘bone) was part of Toast of the Nation, NPR’s annual all-night New Year’s Eve jazz party. Yr Hmble Srvnt was on hand to produce the show for the net. In my previous life coordinating this production was Tension City; the logistics of pulling off six live shows through multiple timezones is only dizzying when it’s not downright frightening. By comparison, spending a day backstage at the KenCen with old friends and terrific musiciains, old pros all, was pure pleasure. But the praise is hard-won and well-deserved. Her voice was in top form, and the arrangements by Michael Abene are clever, quirky, and swing. You can check out a couple of the CD cuts (recorded with the excellent WDR Big Band) here. The Kennedy Center show was the first time that Austin has taken the show on the road with a pared-down octet, and the results were pretty impressive, particularly for the second set that we broadcast live to the nation. Though I have to say that my lasting memory was a haunting version of But Not For Me, featuring just Patti and pianist Mike Ricchiutti. But don’t take my word for it: check out the whole concert on the new NPR Music site. Update 1/2/2008: Critic Mike Joyce talks about Patti’s “Star Jones Moment” in his review of the concert in today’s Washpost. You can read the review here. Monday was a good night for Cleveland at the Jake and at the Ken Cen, where yours truly got the chance to see the fabled Cleveland Orchestra up close and personal. Not that they’ve been strangers here…their press dept. helpfully pointed out that the orchestra has played 57 times in DC, including 43 times in the Kennedy Center’s 36-year history. And they are still as good as advertised: In his excellent NPR Listener’s Encyclopedia of Classical Music my old friend Ted Libbey writes: “The Cleveland Orchestra is very nearly in a league of its own, a crack ensemble with an esprit de corps matched by only a handful of orchestras in the world. Its recordings are the discographic gold standard. ” Hard to argue with that assessment, on disc or in person. Monday night the orchestra had plenty of virtuosity on display, to go with usual crack ensemble playing and spot-on intonation. And, unusually, pride of place to the viola section, who were seated opposite the first violins, with the cellos and second violins filling in the middle around conductor Franz Welser-Most. On the program: Mozart’s Symphony No. 28. Not a symphony you hear all that much, but with some absolutely propulsive outer movements with some feverish fiddling. You want a “discographic gold standard?” The October ’65 recording made by George Szell and the Clevelanders (reissued on CD in 2006) is still amazing. Clarity, balance, and speed – with no sacrifice in precision. 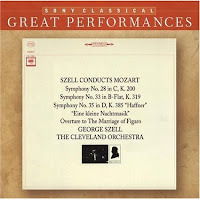 When critics talk about Szell’s ability with Mozart as “chamber music for symphony orchestra,” they’re talking about recordings like this. and quickly- as they would for any virtuoso pianist. But what really grabbed me was not so much a “Strange Place” but a location thoroughly familiar to us hardy Harpers Ferry residents. Adams’ inventive scoring includes a Doppler-effect freight-train rumbling through the brass and percussion sections….a sound I hear routinely as long freighters go rumbling into the night through the Harpers Ferry Gap. Adams absolutely nailed the sound. Despite the fact that nearly everything Adams has written is available on CD, you can only hear this snippet of the Guide on Adam’s extremely well-done website. Strange but true footnote: This piece represents a connection between the Pulitzer Prize- winning composer and the 2nd president of the US beside the fact that both were born in Massachusetts: The “Guide to Strange Places” was commissioned and first performed by the Netherlands Radio Philharmonic at the Concertgebouw. And before he succeeded George Washington, the “other” John Adams was the first US ambassador to the Netherlands, where his efforts at diplomacy are seen as so significant that he recently merited a three-part series on Radio Netherlands called Adams in Amsterdam. And then I found out there’s a John Adams Institute in Amsterdam…“an independent, nonprofit foundation dedicated to furthering a longstanding tradition: cultural exchange between the USA and the Netherlands. Founded in 1987, the John Adams Institute continues to expose the best and brightest American writers and thinkers to audiences in The Netherlands. As the first truly tragic symphony, concerned with loss, isolation, and despair, it projects a negative image of Beethoven’s triumphant aspiration, in place of spiritual transcendence, it seeks annihilation. This marks a fundamental turning point in the history of the symphony. Psychologically, the Pathetique symphony marks the beginning of modernism. The Clevelanders did not disappoint. And the Kennedy Center audience behaved…no applause at the end of the third movement, to my surprise. Lots of applause at the end, and no encore either. Now they’re off to Carnegie Hall and the Musikverein. And I’ll have more on Adams in a bit. Postscript: The Washington Post review of this concert can be found here. Don’t know how the reviewer got the impression was a U.S. Premiere, however, since DC’s own National Symphony Orchestra played it on their East Coast Tour three years ago.